Volumetric Technologies designs and manufactures the highest quality dispensing nozzles and liquid filling nozzles in the industry to meet a variety of needs. Made with precision and built to last, our equipment combines innovative features customized for a perfect fit every time. Whatever material you’re handling, from food to cosmetics and thin liquids to particulate thick products, we have the appropriate filling machine nozzles for you. Volumetric Technologies has been working with manufacturing companies with filling and packaging lines; we have experience filling hundreds of products, so you won’t have to worry about getting incompatible nozzles for your current filling systems. Talk to our engineers at Volumetric Technologies. We can customize our products to match your existing filling machines and packaging lines. Years of supplying machines and accessories to customers have taught us the importance of flexibility and versatility, these are qualities we provide for you. Volumetric Technologies: Experienced, agile, and leading the way in dispensing nozzles and packaging equipment production. View our products below. Over the years Volumetric Technologies has designed and manufactured many custom dispensing nozzles that our clients have loved so much they’ve become standard! We carry a variety of standard dispenser nozzles for your filling and production line needs. 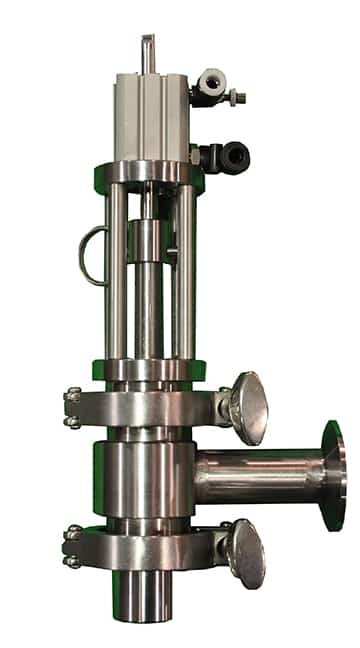 Does your company have a need for a customized dispenser nozzle application? 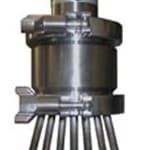 The filling and packaging line equipment experts at Volumetric Technologies can design and manufacture a custom dispensing nozzle to suit your specifications. As the name suggests, our standard line nozzles are products we have developed over the last 24 years, but at VT our designs are more robust than the competing nozzles designs. Below – what the hell is heterogeneous? Don’t you mean homogenous? Cakes and Baked Goods– For dispensing thick icing and heterogeneous mixtures, like decorative icing on cakes and pureed fillings on pastries. 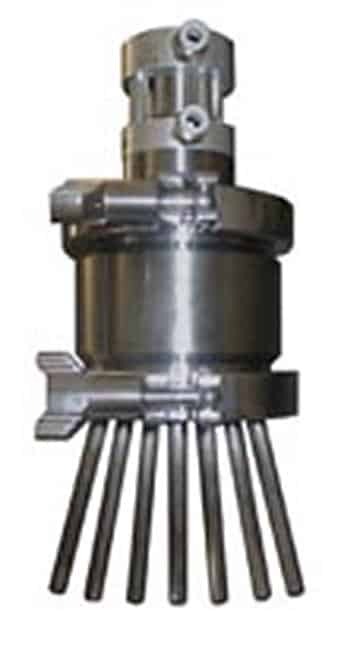 We also have a rotary hand-held nozzle ideal for applying batter and slurries evenly in steel baking pans. Packed Food – For depositing many kinds of food, like in ready-to-eat meals. Cosmetics and Household Products – For filling containers and bottles with products of varying consistencies, from aqueous perfumes to thick lotions, creams, and toothpaste. Custom dispensing nozzles, challenge us, tell us about your application, we would be happy to design and build creative solution for your application that will best fit your needs. 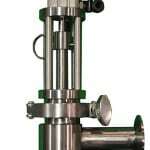 Why Choose Liquid Filling Nozzles by Volumetric Technologies? Having worked with many clients over the years, we’ve long since learned how important it is for filling machines to accurately and precisely dispense the right amount of product in a cup, bottle, bag, or container. We manufacturer an entire slate of volumetric filling machines, but in case you’ve already invested in equipment, Volumetric Technologies offers dispensing components like liquid filling nozzles. Wasted product, messy filling stations, and inaccurate quantities dispensed in bottles and cans — these do more than inconvenience your staff. They can cause your sales to plummet because poor product handling can reduce its quality and create inconsistencies that disappoint customers. Let Volumetric Technologies find lasting solutions for these problems. Our high-performance liquid filling nozzles are compatible with all types of filling systems. They are designed to cut-off product flow cleanly and consistently. Volumetric Technologies is all about quality, precision, and longevity. Our filling nozzles, have been designed to prevent drips and cut off liquid flow precisely and cleanly. Our products, which are fashioned from superior-quality 316L stainless steel and specialty alloys, last long and can perform even in extreme conditions. More importantly, they are responsive when installed alongside automatic filling and packaging systems. Don’t miss out on the benefits of custom-made, industrial-grade, liquid filling nozzles. Fill out our contact form to schedule a consultation with our engineers.